William Allen lived and worked at Camp NP-2 in Cabin John, and was well known to his fellow enrollees as the “camp jitterbug No. 1” for his dancing all about the camp. In June 1938, the camp welcomed a new batch of enrollees from Baltimore. Not long after that, Allen stopped dancing – those “Baltimore boys” were experienced visitors to jazz clubs, and Allen was essentially shamed into early dancing retirement by his friends. As can be seen from this brief anecdote, life wasn’t all work and no play in the CCC camps stationed at the C&O Canal. Somehow, between their 8 a.m. to 6 p.m. work schedule and a 9 p.m. lights-out, enrollees found time to participate in recreational activities ranging from sports, music, religious practice, dramatic arts, or simply lounging about with friends in the mess hall or library. A few activities are depicted here to give you a sense of what these men did on any given day beyond labor on a canal. 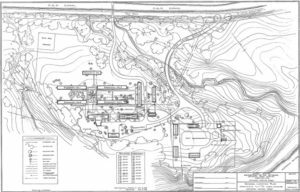 The camp mess hall was one of a few centers of life for enrollees. Enrollees all dined together for breakfast at 7 a.m. and “supper” at 5:10 p.m. Lunch (or “dinner” as it was called) was served at noon, with some eating in the mess hall and others receiving a “field meal” at their project site. The Army managed the food program and issued a field guide of menus and recipes every thirty days. Each camp mess officer, who was well-trained at Army cook schools, was issued rations credits to order from Army depots. Field meals consisted of non-perishable foods, while camp meals were usually prepared fresh by camp staff. Cooks prepared a varied diet that included regionally-available foods such as oysters and clams. Other foods included basic staples like milk, eggs, bread, and varied fruits and vegetables. Cooks also prepared at least one protein for most suppers and dinners, including meats such as bologna, pork shoulder, salmon, beef liver, corned beef, and ham. Breakfasts usually consisted of milk, eggs, bread, and a fruit, such as peaches, cherries, or pears. It is quite likely these men were eating better in the CCC than they ever had before, an idea that is supported by the reported 10+ pounds of weight gain for the average enrollee. By the last week of the month, the “thoughtful and thrifty” re-rolled hand-rolled cigarette stubs out of desperation before struggling with nicotine withdrawal by the final days of the month. This anecdote provides a hint to the prevalence of tobacco culture at the canal camps and the relative poverty of enrollees. Co. 333 went so far as to organize a pool (billiards) tournament consisting of four different game variants and prizes awarded to winners and runners-up. Winners’ prizes ranged from a carton of cigarettes for some champions to a single pack for the runner-up in the Last Ball competition. Other than billiards, enrollees engaged in baseball, basketball, billiards, swimming, ping pong, wrestling, boxing, and card games. Enrollees traveled into D.C. weekly to use Twelfth Street YMCA facilities primarily for swimming contests, some of which were organized by administrators. Educational Advisor C. Rushton Long organized a lengthy tournament that culminated with four men (Robert Welch, Thomas Jackson, Henry Jefferson, and Silas Samuels) competing at the YMCA. The reward? The two finalists, Jefferson and Samuels, were sent to a five-day lifeguard training program at Fort Keede. This may seem more of a punishment, but Long believed he was providing these men with training for a future career given the economic hardships of the time. Long also served as the team’s head basketball coach and successfully campaigned for the construction of a baseball diamond at what is now a parking lot in Carderock Recreation Area. Basketball was probably the most popular recreational activity amongst enrollees. Boasting basketball uniforms that they believed to be some of the best out of the entire CCC, each enrollee-player also wore a warm-up sweatshirt with the number 333 sewn onto the front. Men from the camp traveled often to play other basketball teams representing other African American CCC camps. 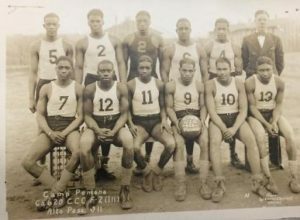 The Co. 333 basketball team played at least six games in their debut 1938-39 basketball season and competed against their immediate neighbors Co. 325, Co. 2317 (Bedford, PA), Co. 2314 (Beltsville, MD), and three other unnamed African American camp teams. Company basketball teams also played against local high schools on occasion, although the details of these events were not documented. 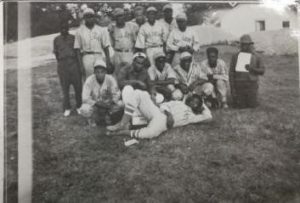 From the companies’ enthusiasm, it seems likely that at least some CCC ballplayers went on to play more basketball or baseball elsewhere either in college, semi-pro, or professionally. Camp NP-2. Notice the baseball field in the northwest corner. Co. 620 Basketball Team, Alto Pass, IL. National Archives at College Park. Breeze Hill Camp baseball team, NY. National Archives at College Park. Click here to view Dr. Howard’s lecture on the CCC and the C&O Canal.